Summer Camp Counsellor Full-Time, Temporary Click Here for Details April 29, 11:59 p.m. Administrator, Data Entry & Donor Relations Full-Time Click Here for Details April 29, 11:59 p.m.
Medical Assistant Full-Time Click Here for Details April 29, 11:59 p.m. Registered Veterinary Technologist Full-Time Click Here for Details April 29, 11:59 p.m.
Veterinarian Full-Time, Temporary Click Here for Details April 29, 11:59 p.m. 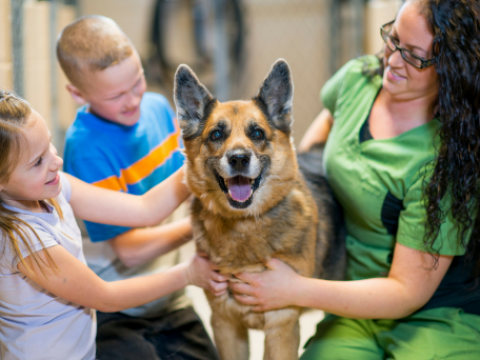 Supervisor, Animal Care & Client Relations Full-Time Click Here for Details April 29, 4:30 p.m.
Want your work to make an impact in the lives of companion animals? The Edmonton Humane Society has been an animal welfare leader in the Edmonton community since 1907. We are more than a shelter and a safe haven for the thousands of animals in our care each year. We play a key role in the Edmonton region by enriching the lives of people and their companion animals not only through our sheltering, but through our programs, services and community engagement. Want to join one of Edmonton’s most reputable not for profits and support our vision to be a model of excellence in the advancement of animal welfare? When you join us you have the chance to make a difference in the lives of animals and to engage with a team of like-minded individuals who love their work and being part of a big impact team! Thank you for your interest in working for our organization. All applicants will be reviewed and qualified candidates may be contacted for interviews. Please note that phone calls regarding open positions cannot be returned due to the high volume of calls received. Resumes must be submitted in Word or PDF format. Please email your resume and cover letter to hr@edmontonhumanesociety.com.